You are here: Home / More / Family Lifestyle / Amazing Organisation Tips That’ll Make Life Easier! 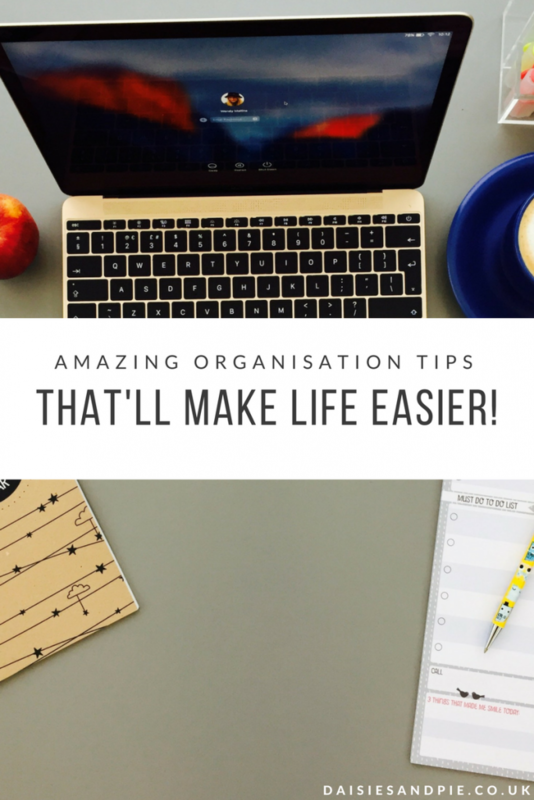 Amazing Organisation Tips That’ll Make Life Easier! As a working mum, life is busy. Here’s my top 10 ways to be more organised, these are easy things to put into place and really made a difference to me keeping on top of stuff! Cut back on the clutter, clear out any unnecessary items, it might be actual physical stuff that you no longer need or use or commitments you made that you could really live without. Make your life easier and ditch the things that make it hard work. Properly tidy up your home. Make sure that all the items you keep, you want and need and find them a proper place. This means you’ll know exactly where they are and where to put them back. Saves so much time in the long run. Anything you can answer, complete easily and quickly or put into your diary straight away, do it. Stopping procrastination stops the build up of piles of things that are just waiting to be dealt with. Spend a few minutes each week doing a family meal plan and stick to it. This means you can easily prep dinners, look at what’s needed and double up on meals to create easy freezer dinners. It’s also a good idea to order food shopping online. Especially if you’re short on time or energy. I like a clean and organised house, it makes me feel happy. Be realistic about what housework needs doing, how clean you want your home to be and how much time you have. Also look at sharing and delegating housework jobs too. This is my housework routine and it can be easily adapted to suit your needs. It’s much easier to fit in everything you want to do if you schedule things into your diary or day in advance. It makes it easier to focus and manage your time. I love a list. Love them, just a couple of minutes each day spend time focusing on the tasks that need doing and jot them in a list, simple. And it means I stay focused, keep on track and achieve what I want. Again something I love. I use iPhone, iPad and laptop to manage my work, my diaries, my home, my kids schedules, everything! They also mean I can multi-task easily as my work-life is completely mobile. Get yourself into a good routine, one that works for you. Work out what you really need to fit in during a regular week and build your routine around it. Incorporate things like sorting out a school day routine, work commitments, meal planning, housework and regular hobbies or after school clubs. You can plan and schedule as much as you like and on the whole it works out fine but as a mum there’s always going to be times when you can’t get stuff done, unexpected things crop up or the kids are sick. Building catch-up time into your regular routine gives you chance to get back on track after a hectic week.